Real estate investing can be a complicated profession. Even though there is incredible money making potential, the process of actually making the money usually isn't fast or easy. The ability to buy properties at a very low price. 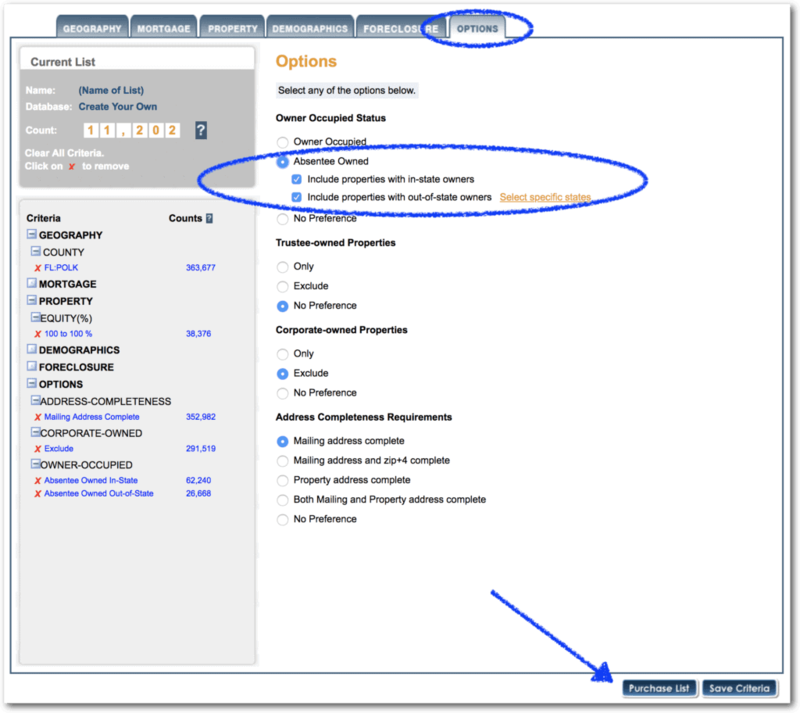 The ability to sell those properties quickly, at a significant markup. So why isn't everyone a real estate millionaire?? Have you ever wondered how the most successful real estate investors are able to build huge businesses and make such a killing? How are they able to pull this off? In my interactions with some of the “big shot” real estate investors of the world (names you'd probably recognize), I've noticed a common theme among all of them. The most successful real estate investors are masters at selling. Whether it's through their slick verbal skills or their vast business network, these people have figured out how to sell their properties in a matter of days (if not hours) and they can do it without even creating a public listing. In many cases, the only reason this works is that these real estate investors had the foresight to create a BUYERS LIST for their business. In this MEGA blog post, we're going to dive into the details of how you can build a buyers list just like this for your real estate business. Let's start at square one. When I say “Buyers List”, I'm talking about a list of real estate investors that are actively looking for new investment opportunities in a given area. It usually consists of their names, email addresses and maybe even their phone numbers. This list should be constantly growing, changing and evolving as new people find you – people who want to buy what you're trying to sell. As a real estate investor, selling properties is something you'll have to do over and over again. This isn't a one-and-done kind of thing… it's something you need to get good at because you will ALWAYS have to go through these motions in order to get paid. Unfortunately, selling real estate is almost never as simple as just putting a “FOR SALE” sign in the front yard. It's also not as simple as calling up your local realtor and telling them to do all the work – because they'll take a painfully large chunk of your profit on every property they sell – and in my opinion, paying these kinds of fees over and over again just isn't a sustainable way to do business. Selling real estate does require some marketing and promotion. To some new investors, the idea of becoming a real estate “salesman” does NOT sound like fun (I get it, I used to hate the idea too), but if you're smart about it – the sales process doesn't need to be difficult or time-consuming. In fact, when you're working with a solid buyers list, selling properties can be one of the easiest and most enjoyable things about your business. In a sense – this list like your “book of business”. Regardless of how big or small it is, this list is worth money – both to you and anyone else who wants to sell their properties to the people on your buyers list (yes, you can do that). When you have a large, engaged group of investors who are hungry to see your next deal, you don't need to rely on selling websites or real estate agents to sell your properties. When you've grown your list long enough, you'll eventually be able to sell properties with one email, and it can all happen without listing your property on the open market. Does this kind of power sound good to you? If you're starting from scratch, the first step in building a buyers list is to start with the list infrastructure. You'll need a few things in place so that people can learn about who you are and submit their information to be on your list. When you have this infrastructure put together, it will save you a TON of time, so you don't have to manually type each new person's information into a giant spreadsheet and send out emails the hard way. The first step is to put together a very simple website, where visitors can see who you are, review some compelling information and reasons why they should be on your list, and then add themselves to your list if you choose to do so. Once this website is set up, it will require almost no ongoing maintenance and luckily, there are a few services out there that can make this process VERY easy for busy people like you and me. Instead of spending days fiddling around with a confusing website interface, you can set up a website that looks incredible and gets results, all in a matter of minutes. One such system is called Lead Propeller. With this service, building your website can be one of the easiest aspects of the entire process. You can literally get a beautiful and fully functional website up and running in a matter of minutes, as I'll show you in the video below. As I mentioned in the video above, if you want to give this system a whirl, use promotional code RETIPSTER at checkout. You’ll get an instant 75% off discount on your first month, and it will help support this website. Also, be sure to utilize some of the free images available on Unsplash (seriously, it will make your website look amazing). If you're going through the motions of setting up a website, it only makes sense to go a few steps further and set up an official email list as well. This will work in conjunction with your website to put your list growth on autopilot, which will free up your time to focus on things that are much more important. There are a number of email marketing services out there and in my experience – most of them aren't that great. I have first-hand experience with several of the well-known names out there and I have to be honest… I've been pretty disappointed with all of them. Most of them aren't cheap and almost all of them are glitchy, slow, confusing and very frustrating to work with. I don't have the patience to deal with these kinds of unnecessary headaches, and that's why I finally landed on MailChimp as my service of choice. I won't say MailChimp perfect, but it is leaps and bounds ahead of the others I've tried. It also allows you to start building your list for FREE. If you want to give MailChimp a shot, I'll show you how to set up your list in the video below. As mentioned in the videos above, once your MailChimp account is ready to go, you'll just have to locate your API key and paste it into Lead Propeller. Congratulations! Now that your website and list officially exist, this is where the real work begins. If you want to succeed at building a buyers list, you need to know how to promote it. 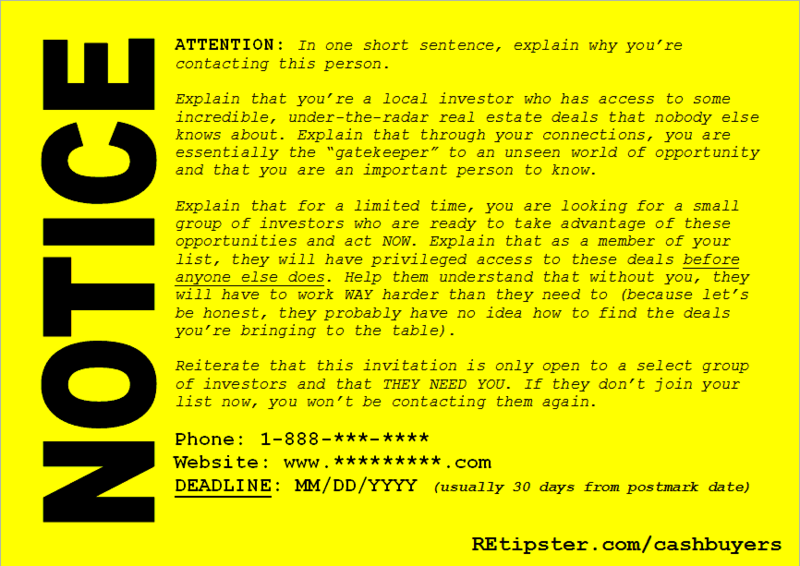 You need to let the world know you have some incredible real estate deals up for grabs. If people sign up for your list, you're going to unload an insane amount of value on them with every email you send, and it might just change their life. The good news is – there are hundreds of ways to promote your website and your buyers list, but some of the most effective methods are less obvious than others, so I'm going to give you a whopping 50 creative list building strategies to start with (so if you aren't a fan of one of them, you'll have plenty of other options to choose from). The great thing about Craigslist is that it's FREE and it's a huge real estate marketplace, which makes it extremely effective. Craigslist has changed a lot since I first started using it to build my buyers list. 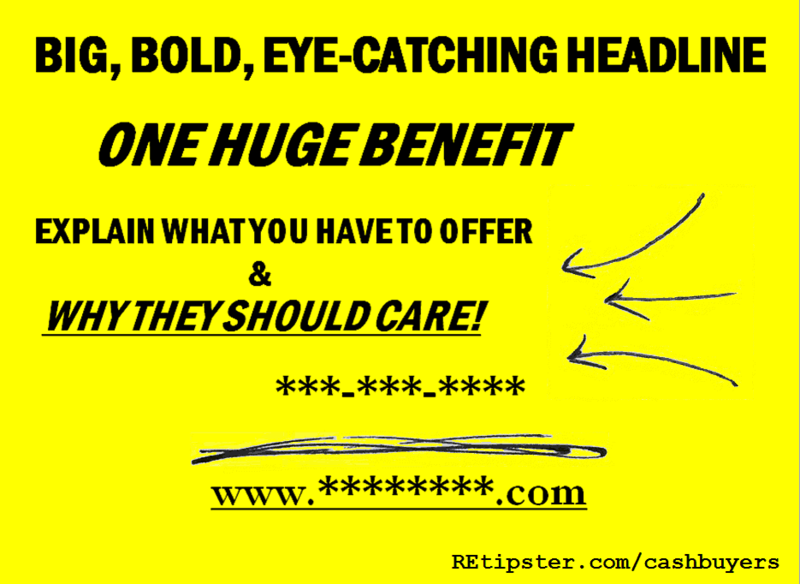 The original technique behind this approach used to be very easy and effective, but over the years (as spammers and other garbage posters started clogging up the “For Sale” sections of the site), Craigslist has ratcheted down their posting criteria to be MUCH more restrictive than it once was. 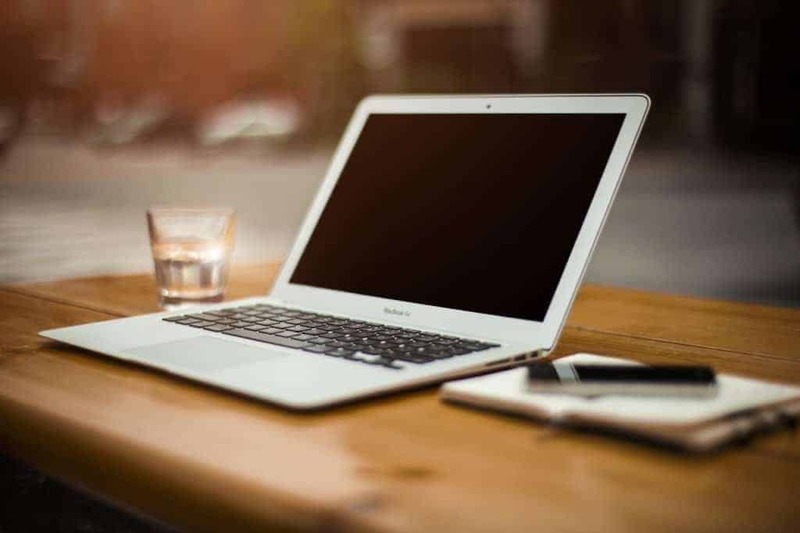 At the time of this writing, there isn't a lot of flexibility in what you can write in your listings (no fancy html coding, no clickable images, no links to outside websites, etc). This means you'll have to find creative ways to let the world know about what you're offering and how people can get in on it. My Realtor friends think I'm crazy. I've got a vacant lot that I'm told is worth $100,000, but I'm only asking $20,000 for it. Why? Because I needed it sold YESTERDAY. As you can see from the pictures, it's not a bad piece of real estate, and by anyone's standards – $20,000 is a steal for this property. Even if this isn't what you're looking for, I'm selling several similar properties and ALL of them are starting at no more than *50% of market value* (there will be plenty more to choose from in the coming weeks). If you have any interest, you can check out the full list of inventory at WEBSITEURL.com. You'll see what's available today, and you can sign up to be notified when the next deals come to market in the coming weeks. For more details on how to write effective ads that comply with Craigslist's rules, check out this blog post. When building a buyers list, direct mail tends to be a bit less effective than when looking for motivated sellers – however, it's still a great way to find targeted individuals and scale your marketing efforts to contact ONLY the people who fit the criteria you have in mind. Probably the most convenient way to get started with a direct mail campaign for finding cash buyers is through a service called ListSource. They bought in the past 6 – 12 months (which means they're active, and they may be looking for more). They paid cash for their properties and did not record a mortgage (which means they probably have plenty of cash resources to buy more, without the need for financing to slow down and complicate the transaction). They bought properties in the same general vicinity as where you're trying to sell (the same city, county or surrounding zip codes). This nice thing about ListSource (and the many other data services out there) is that they can make it very easy to narrow down a list of people who fit these exact criteria. To narrow down this specific demographic, you'll want to start by choosing the “Geography” of whatever market you're targeting (I'd suggest starting with the state and county), and pick the state and county where you're working, and add the specific county (or counties) to your list. 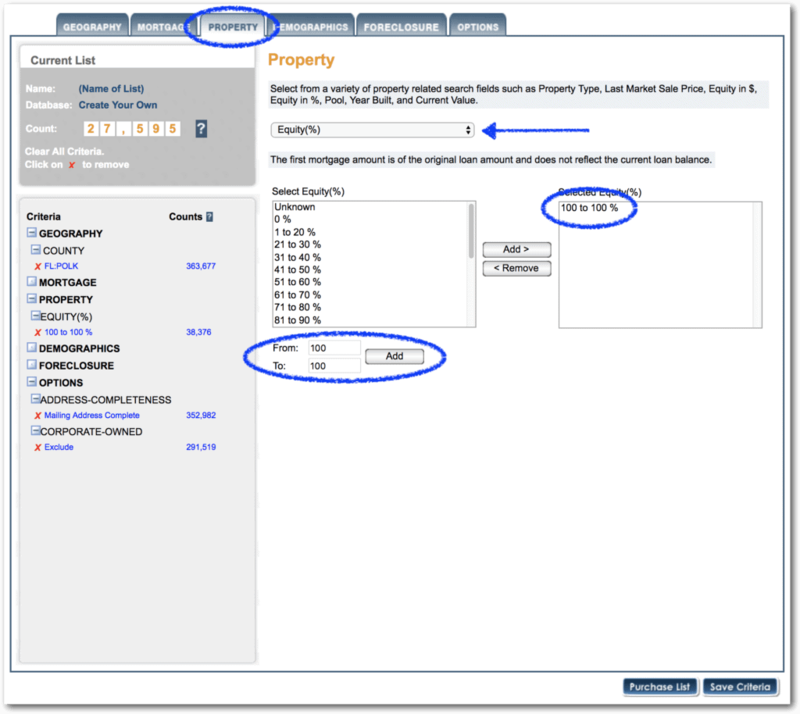 Next, you'll search under the “Property” tab and use the “Equity%” filter. Then, instead of selecting a preset – type into the boxes below “From: 100%” and “To 100%”. Then, under the “Options” tab, choose “Absentee Owned” (and leave both of the sub-boxes checked). Once you have these items checked, you will have access to all the cash buyers. 🙂 Just click on “Purchase List” (lower-right corner) and you can download your list. If it this sounds confusing, check out the video below and I'll walk you through the process. Once your list is sorted, the next step is to upload your excel file to Click2Mail, which will fully automate the printing, stamping and mailing of your postcards (and they'll do it for MUCH less money than it would cost you to do it all yourself). If you aren't sure what kind of postcard should be sent to your recipients (i.e. – What should you say? What should you offer? How can you get a response from your recipients? ), later in this article, I'll show you some highly effective postcard templates that can elicit a solid response from your direct mail campaign. 3. Using the same approach explained in the Craigslist video above, join some local Facebook Groups (ideally, ones that are geared towards real estate investors) and pull new traffic into your website. 4. Include your website link in your email signature (make sure everyone you email knows about your buyers list). 5. Include your website link in your forum signatures (make sure every comment and forum post you put on the internet includes a mention of your website URL). 6. If you have any other websites on the web, add an opt-in box or link back to your landing page. 7. Get out and place some bandit signs around your local market area (assuming it doesn't conflict with any local rules). 8. Ever see other bandit signs around town? Call them up and see if they want to join your list! 9. Post your business cards and/or brochures on some local bulletin boards (restaurants, salons, college campuses, schools, etc.) – there are a lot of eyeballs that pass by these areas every day. 10. Attend some local REIA (Real Estate Investor Association) or RPOA (Rental Property Owner Association) meetings. 11. Attend some local Realtor Networking Events and Classes (note: you don't always need to be a licensed realtor to attend these). 12. Call your local Title Company and ask if they can give you any ideas who the local power players are. 13. Call some local home builders and see if they are looking for any new rehab opportunities or construction projects. A lot of these guys are constantly on the looking for new buying opportunities that make sense. 14. Network with some local mortgage lenders, ask them for ideas on who is buying right now. 15. Call some local “For Rent” signs, talk to the landlords and see if they're looking for any new investment opportunities. 16. Call some Section 8 property owners and see if they're looking for more opportunities. 17. Attend some Tax Deed or Tax Lien sales. These are FULL of hungry investors who are looking for deals. 18. Attend some Foreclosure Auctions, these are saturated with cash buyers. Tell them about your properties for sale and you may have new buyers tripping over each other to join your list! 19. Call some Hard Money Lenders and see if they can help you make any local connections. 20. Find some local real estate attorneys and ask if they can point you towards any hungry cash buyers (or if they'd like to join your list themselves). 21. Talk to your local banks and credit unions, see if they can help you understand what their biggest sources of buyers are (since you are essentially offering a complimentary product/service). 22. 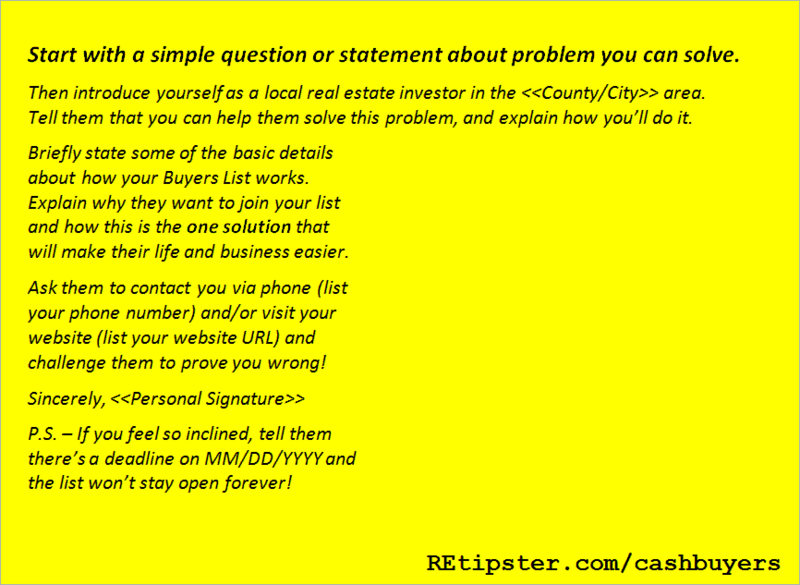 Whenever you call anyone, to inquire about any real estate listing as if they'd like to be added to your buyers list. 23. Whenever a buyer calls to inquire about your current listings, ask if they'd like to be added to your list. 24. Call some of the “housing wanted” listings on Craigslist and see if they're looking for new opportunities. 25. Check the MLS for properties that have sold for cash in the past month. Find the owner of the property and contact them to see if they'd like to be added. 26. Create a short video introduction about your list and the opportunities you have to offer. Post it on YouTube, and embed the same video on your landing page. 27. Let the world know about your properties through public speaking engagements. 28. Search for “Real Estate Investor” on Facebook, Twitter and LinkedIn to find anyone in your area who has this listed as their job title. Reach out to them and ask if they're interested. 29. Call up a few local building inspectors and ask if they know of any good connections (they deal with some of the highest volume buyers and sellers in your market). 30. Talk to some local appraisers. They will know some of the biggest names in the business and which investors are currently buying properties. 31. Make connections with some of the other sellers in your area. Leverage their networks to find buyers for your properties. 32. Talk to some property management companies in your area. These people work with dozens of hungry investors and have tons of local connections. 32. Join some Real Estate Investor forums and get connected with other buyers and investors in your area. 33. Search for local groups on BiggerPockets and figure out which people are looking to buy properties in your area. 34. “Reverse Bird Dogging” – Call some of the well-known investors in your market. Give them your personal attention, tell them that you have some great opportunities and that you’ve been thinking specifically about them (and what they'll get by joining your buyers list). 35. Call some local environmental firms and see if you can get any indications as to who the biggest real estate buyers are in town (note: this will apply almost exclusively to commercial properties). 36. Check out your local home builder conventions and trade shows. Talk with the exhibitors and attendees and see if you can make some connections with buyers who want to be on your list. 37. When people submit questions on your website, give them an optional “checkbox” to voluntarily have their email address and other contact information automatically added to your list. 38. When prospective buyers ask questions and inquire about your property listings on sites like Zillow, eBay, LandWatch and the like, add their email addresses to your buyers list (warning: use this approach with caution – as it could be perceived as spam by some recipients, since you didn't obtain their permission). 39. 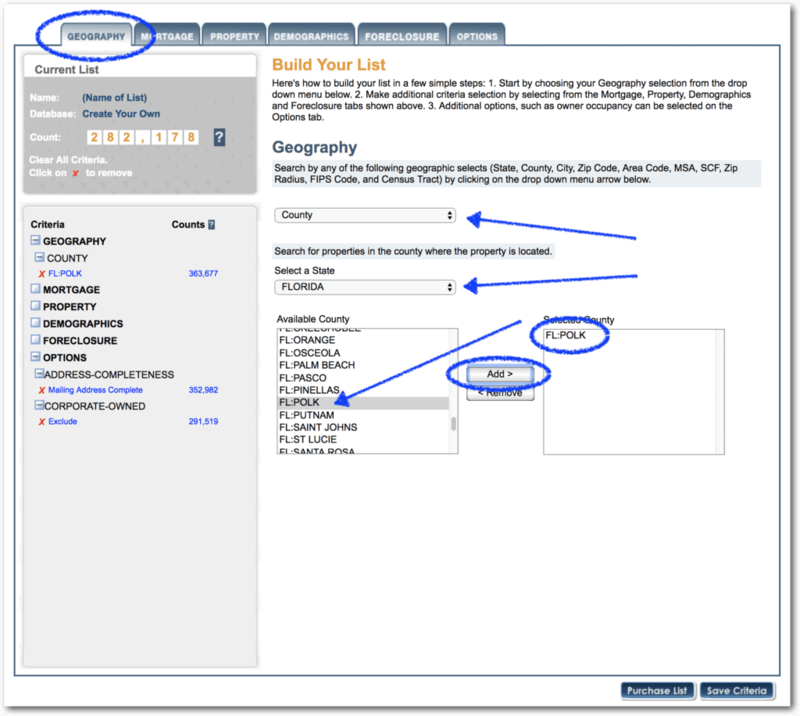 Facebook Advertising: Advertise for the key demographics in/around the zip codes where your properties are located. 40. Google Adwords: Advertise for keywords like “land for sale” and “land investment” (and similar keywords) in/around the zip codes where your property is located. Pull visitors to your website to see your listings – or send them to a specific listing that you're focusing your marketing efforts on. 41. Newspaper Ads (these may appeal to some of the “old school” investors in your market). 42. Use services like FlyerCo and Vflyer to reach buyers and get more attention. 43. FindCashBuyersNOW from Kent Clothier (note: I've never tried this myself, but I've heard positive reviews from trustworthy people… so take that for what it's worth). 44. Interact with other investors on the BiggerPockets Marketplace. 45. Attend some paid seminars and network with other local attendees. 46. Create a few Banner Ads with Canva and start paying for direct advertising on relevant websites. 47. Join Connected Investors and let others know about your buyers list and landing page. 48. Put a giant magnet or sticker on your car and advertise wherever you go. 49. Join your local REIA and start attending meetings. You'll meet all kinds of buyers there! 50. Be the Real Deal. When people see that you do what you say and bring legit value to the table, the word will get out and your list will start growing itself. As you can see, there is no shortage of opportunities for you to start building your buyers list. I'm not telling you what to do here… but I think it's important to remember the 80/20 rule. 80% of your results are going to come from 20% of your overall efforts. So figure out which methods are going to garner the best results and focus your efforts there. Don't try to do EVERYTHING on this list. You don't need to become an expert at ALL of these methods – heck, I'm not! Instead, spend some time pursuing a small handful of the ones that sound promising and focus on getting really good at just 1 or 2 of them. Once you've got your target set, you can keep sharpening your promotional skills in those specific areas. It's important to remember – if you're delivering real value, doing what you say and NOT using cheap gimmicks to build your list – you'll find that over time, your list will start to grow itself. This should go without saying (but I'll say it anyway), being a sleazebag is NOT a good long-term strategy. The real estate industry is FULL of people who flake out and lack moral integrity (because let's be honest, it's very easy to lie to someone you'll never meet face-to-face). If you're simply doing what you say and saying what you do – you will automatically stand out from all the other “wannabe investors” in your market, and the few people who actually know what they're doing are going to take notice. If you're still looking for more ideas that aren't covered here, feel free to check out this forum thread, which takes a deep dive into several other list building strategies that aren't covered here. As we've clearly established, there are ALL KINDS of ways to build your buyers list – and in my experience, one of the most effective techniques is direct mail. Before we go any further, let's get one thing straight – direct mail is not an idiot-proof strategy. To get great results out of a direct mail campaign, there are a lot of variables you have to get right… but if you take your time and think carefully about how you're executing this process – you'll see what I'm talking about. There are many ingredients that go into a successful direct mail campaign, but one of the most important ones to get right is conveying the right message. To convey the right message, it all comes down to your communication skills. Your ability to say the right thing, in the right way is a pretty big deal. This ability doesn't come naturally to everyone, but if you can find a way to craft your message well, you can get some great results. On the same coin, dropping the ball in this area can hurt pretty bad and yield some disappointing results, so in an effort to help you avoid this kind of stumbling block – I want to show you how some of my mail pieces work. With any luck, you might just walk away from this article with a few new ideas on how you can handle this part of your list building process. What Makes Direct Mail Work? I'm just gonna come out and say it – most people are morons when it comes to written communication. I'm reminded of this every day (and you probably are too) when I open up my mailbox and find a dozen marketing solicitations that are cheesy, thoughtless, poorly written and basically designed to be ignored. Do you ever get envelopes in the mail that you just KNOW are junk? I get them all the time and I literally throw them in the trash without even opening them. Suppose you got both of these letters in your mailbox today. Tell me honestly – which one are you more likely to open? The first time I posted this question on social media, almost every single person said that they would open the top one, and the bottom would go right in the trash. 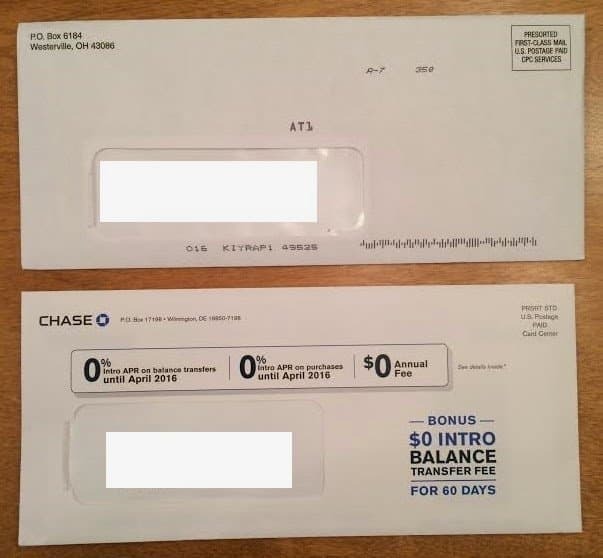 What is it about the bottom envelope that just SCREAMS “junk mail”? It leaves very little to the imagination (I can see what it is from a mile away, and I don't want it). I get at least one of these each week and they all look the same. There is nothing personal about it. It's way too polished, and it's obvious that millions of people are receiving this exact same letter. We've all just been trained to know what junk mail looks like – so when big companies blow millions of dollars on this kind of “sales cheese”, you and I both know instinctively where to stick it. How can you make your mail piece look different from all the other junk flying around out there? I’ll admit – it’s not always easy to come up with something that stands out from the crowd. When I first started working with direct mail, I found that it helped to look at my design from the recipient's perspective. I started thinking about my own thoughts and habits as a consumer. What kind of mail did I actually take the time to read? What kind of mail did I throw away without thinking twice about? I started noticing some patterns about the mail I would read vs. throw away and once I developed some certainty about what was working on ME, I started applying those same principles to the mail I was sending out… and the results seemed to work pretty well in my favor. The reality of direct mail is – you only have a split second to grab someone's attention. You need to INSTANTLY show them why you're worth paying attention to and ultimately, move them to action. Luckily, there are a lot of ways to pull it off. I’ve experimented with a number of different messages and mail formats over the years and after trying dozens of different approaches (some of which succeeded, and some of which FAILED miserably), these postcard templates have consistently produced the best results for me. Why Does This Get Noticed? Think about it for a second – if you received a postcard like this in your mailbox, would you take 30 seconds to read it? Not everyone does, but most people do. The goal with this postcard isn’t to be flashy. The goal is to be real. When a mail piece comes blasting out of the gate with “SELL! SELL! SELL!”, people will instinctively ignore it. Why? Because that’s what every piece of junk mail does. In a world full of cheesy sales letters and annoying messages that nobody cares about, being down-to-earth is different and this kind of straightforward communication can leave a lasting impression on people. To some, this postcard almost comes across as alarming at first sight – not so much as to scare them, but enough to trigger their curiosity enough to take a closer look. Similar to Template #1, most people don't get many postcards that look like this. It's different and conveys an immediate sense of importance (more so than the generic “BLAH BLAH BLAH” messages we all get hammered with each day). The benefit with using this card is partially in the choice of words, partially in the hand-drawn graphics, and also in the fact that it’s double-sided (which means we’ve got two chances to make a first impression – and it literally can't be thrown away without first being glanced at). Another aspect of this postcard that stands to most people is the hand-drawn graphics (the star, the lines, the arrow). Am I right? Did they stand out to you too?? Well, they work. In terms of “attention-grabbing”, I wouldn’t be surprised if they’re even more powerful than the actual text on the postcard! As I mentioned earlier, the message on your postcard is only one of many variables that need to be fine-tuned in your direct mail campaigns. There are other areas that need to be fine-tuned just as well… but at the same time, you might as well not even bother with all of this if you’re not going to pack a solid punch with your message. Remember the importance of looking different. Be real and you won’t have any problems standing out from the crowd. 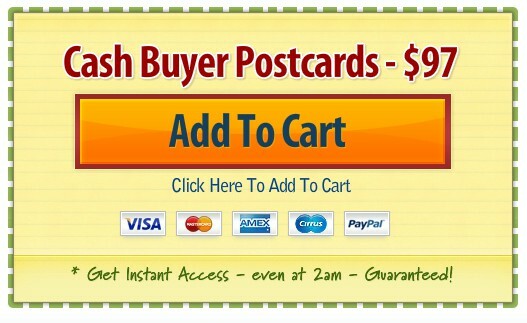 Want To Use My Postcard Templates? As you probably noticed, the examples above give a good overview of the format of my postcards, but not the exact wording. I do this because I don’t want you to feel like my postcards are the only ones that will work for you. I've certainly had some success with my postcard templates, but it's not because I'm the most prolific writer in the world… it's just because I tried, and tried, and tried again. It's entirely possible that you are a better writer than me, and I don’t want to imply that my postcards are the best ever written. There is nothing magical about the wording I use, I’ve just invested a lot of mental energy into refining this type of written communication – to the point where I have a pretty solid grasp on how to get responses out of the right people. …or you can start using the exact same templates I do right now (and just for kicks, I’ll throw in a couple of extra bonus templates, eye-catching graphics, and a video tutorial to help you along the way). Note: When you sign up as a REtipster Email Subscriber, I’ll send you an instant $20 off “Discount Code” for this item (get it for $77 instead of $97). There's no pressure of course – the discount is there if you want it. When you're building a buyers list, it's easy to get wrapped up in the task of growing your numbers and reaching out to new people, but when you've finally built up a sizable, captive audience… then what? How are you supposed to convert these relationships into actual dollars? If your experience is anything like mine, you probably know what it's like to get BOMBARDED with an endless barrage of junk emails that you never signed up for. Let's just be honest about this… everyone knows how annoying it is to be an email subscriber these days. The problem is – 99% of the email marketers today are horrible at email communication (how's that for irony?). These people are ignoring some very simple rules of email etiquette and as a result, they end up alienating those who matter the most. 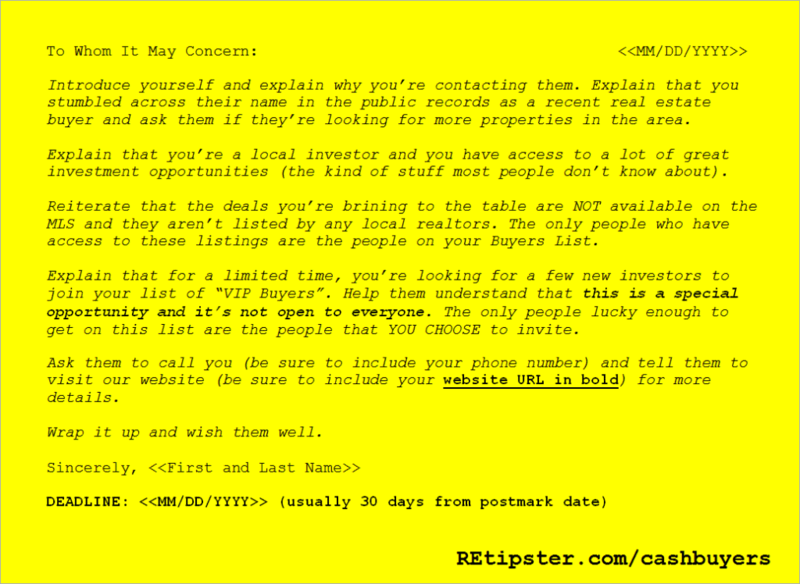 The last thing this world needs is another clueless “email marketer” spamming the innocent victims on their list… so in this section, I'm going to give you some basic ground rules to follow when you're corresponding with the investors on your buyers list. To start with, I think it's important to remember (ALWAYS remember) – why did your subscribers sign up for your buyers list in the first place? To hear about the new real estate deals I'm bringing to the market. They did NOT sign up to hear about some new product I'm plugging. They did NOT sign up to hear about the hottest new educational program. They did NOT sign up to hear about totally irrelevant garbage that has nothing to do with the benefits outlined on my landing page. People signed up for my buyers list because they trusted me and in doing so, they gave me their most valuable commodity – TRUST. The last thing I'd ever want to do is violate that trust by doing a “bait and switch” and sending them daily emails full of unrelated information. I try to keep my emails short, simple and relatively infrequent. The only time I ever send out a new message is when I have new, legitimate opportunities for them to buy the properties I'm trying to sell. See our listing page for more information! The emails you send to your buyers list don't have to be long or complicated. In fact, shorter is better. If you're working your business right, you should be bringing deals to the table with value that clearly speaks for itself (which means you won't need to write paragraphs of “noise” just to prove your point). As long as your listings clearly convey the value in each property you're trying to sell, you've done your job. The first step is to create a detailed property listing on my selling website and simply link to the listing in my email. Note: I do have an affiliate relationship with Lead Propeller. If you'd like to give it a try, be sure to use promotional code RETIPSTER when you sign up. This will give you 75% off your first month and the REtipster Blog will earn a small commission from the sale. Thanks for your support! If you don't have a dedicated selling website, another alternative would be to create your listing on a free site listing site like Zillow or Craigslist and link directly to those pages. The upside of posting your listing on a larger, free listing site is that your ads will get more exposure this way (since it's on a platform with millions of active users), but the downside is that you won't own that platform, which means you can't control the look and feel of the information and what those platforms do with the information you submit. If you want to use this exact template, you can download it for free right here. If you're not already familiar with “autoresponders” – these are pre-written emails you can put together ahead of time, which automatically get sent to your subscribers in a sequential order after they've subscribed to your list. What’s nice about an autoresponder series is that you can take people through a sequence of emails (which begin on the first day a new person subscribes). In other words, you do the work of writing these emails ONCE, and then they go out on autopilot for every new person who signs up. In my case, autoresponders can be useful in sharing relevant tips and tricks with my audience, which helps reinforce the “trust factor” – because I can legitimately help them learn how to find new deals, improve their investing business and be more effective in their business without asking for anything in return. Autoresponders are also a good medium for letting your buyers know about your various social media profiles (Facebook, Twitter, G+, LinkedIn, Instagram, etc). I don't hammer my buyers list with this information – but I do send out ONE polite email, letting them know where they can find me if they want to follow along and be notified about my properties on those platforms as well. You don't need to send out weekly emails to your buyers list, but as a general rule of thumb, it's not a bad idea to make sure your audience is hearing from you at least once a month – for no other reason than to simply remember who you are. It's also worth noting that while you shouldn't ever sell your list to a third-party, you may encounter opportunities to market properties to your list on behalf of other investors and agents. Think about it – if you build a massive audience that has already expressed interest in buying a specific type of property, wouldn't that audience be just as valuable to other real estate marketers too? I've come across this on a number of occasions and under the right circumstances, it can provide a win-win-win opportunity for you, your buyers list, and the person with a property to sell. Remember – just because YOU don't have a property under contract, doesn't mean you can't promote that property on behalf of someone else for a fee. If you find an investment opportunity that constitutes the same kind of value that you would have brought to the table with your own properties AND you disclose to your audience that you're promoting this property on behalf of a third-party – this could be another way to earn revenue from your list in an honorable, legitimate way (either through a one-time fee from the third-party, or a commission from them if/when the property sells). Some people run entire businesses that consist of nothing other than this… and when you're able to offer this kind of added benefit to your buyers list (in the form of more great opportunities) – why not help them out? Again – it's important to acknowledge that there's a fine line between adding value for your buyers list and slipping into the territory of spamming them. It's also worth noting that a few states have specific laws against this type of practice (i.e. – selling real estate on behalf of someone else if you aren't a licensed agent), so be sure you understand what your state's laws entail before you wander too far into this territory. You definitely DON'T want to wander down this path if it's not legal in the area where you're working. If you're ever in a situation that blurs the lines between these two territories, think long and hard about what you're doing – because once you've lost the trust of your audience, you're usually not going to get it back. 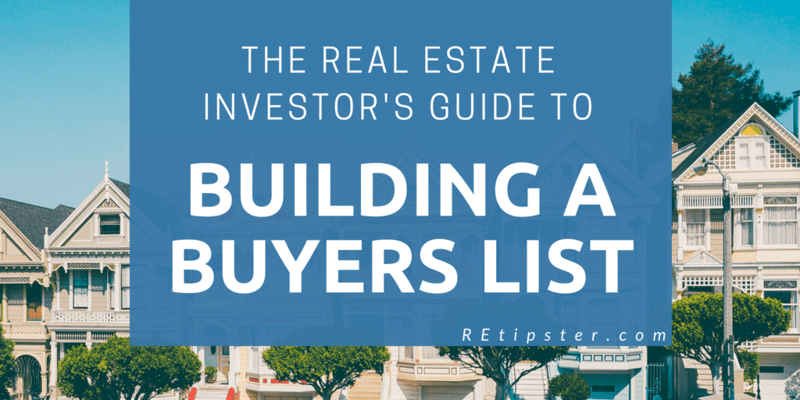 Hopefully, you're starting to see what most successful investors already know – there is real value in building a buyers list. As we discussed, there are MANY ways to go about putting a buyers list together, but not all methods are equally effective. In the end, the only way to master this process is to get your feet wet and start learning what kinds of tactics work well with your target audience. Have you started building a buyers list for your business yet? What strategies, tactics and resources have worked well for you?